Had really planned to put some consideration to these two leftovers from last week's snowbound retreat. I think they will make nice lap quilts. I need to audition some fabrics for the side triangles, but the van is still at the foot of the driveway and no way am I going to venture down the hill just to retrieve a few projects when I have plenty to work on here in the sewing room! Take a look at the ice that fell off our roof, but not before the ice dams caused leaking around the fireplace chimneys. Husband and SIL scraped much of the ice off the driveway yesterday, but it's still too treacherous for her to get her car down so she can get on her way back to Savannah. I ain't goin' anywhere! Except maybe to Patchwork Times to see what others are working on. ... snowbound at a quilting retreat. Read about the weather here. So my first order of business at the retreat was to sandwich and quilt it. I got it pinned only to discover I didn't have an appropriate color of thread. Yes, I could have borrowed some, but I wasn't too keen on working on this without my big table for support, so it went back in the box. Next up was Athena's Puzzle. This is one of those Someday Projects that should have been quick and easy but morphed into piles of strips and mounds of blocks that I couldn't make work together. In the end I had enough for THREE quilts! The remaining two quilts will go on my design wall tomorrow, assuming I can get down to my car and retrieve them, to audition setting triangle fabrics. The cool thing is I made this on my recently refurbished Featherweight, the machine I learned to sew on. Thanks to a friend who offered to clean it for my birthday, but ended up reworking some of the electrical parts. Now it's also my Christmas present and maybe next year's birthday, too! After that quick project it was time to break out the dinosaur, a 12-year-old project from the book Strips and Curves by Louisa Smith. I was determined I would finish it in some fashion before the week was out. I decided to cut the remaining strata with the templates that accompany the book and see what I could come up with. The last day I finished making random blocks with the S&C remnants, then broke out an Exploding Pineapple in 40s fabrics that desperately needs some solids to calm it down. I got some pieces cut but little sewing done and no pictures. That will go in the queue for the coming week as it will be a class sample for the class I am scheduled to teach at Fall Quilt Camp. I want to be able to show it as an example in the class brochure when it is posted on Peg Bingham's website. Due to the weather we were never able to make our usual trips to Whittle's or the shop in Leitchfield. Probably just as well. But, I belatedly received four Christmas FQs from last year's secret sister to add a yard for the year. My plan was to post periodically throughout the week, but I was not able to connect to the internet through their WiFi. What was worse is that cell service is sketchy and I was depending on email to communicate with family at home. Thank goodness SIL texts! It was so pretty and quiet -- and COLD! It continued to snow all day till we had about a good 8 inches accumulation. Thankfully the staff picked us up in a van and took us to meals in the dining hall. By Tuesday the sun was out and the staff had begun to dig us out. Can you see the frozen frost on the tree sparkling against the beautiful blue sky? Some of the hardier ones enjoyed walking in the snow to the dining hall. I had not taken any boots (though I did have the presence of mind to take a spare pair of shoes!) so I opted for the van. Every day the staff did a little more to clear a path out of camp. We all had packed in such a hurry that some critical things were forgotten -- like one suitcase, project instructions, thread, scissors -- what one person forgot another would share. And the week passed a lot faster than we imagined. Turns out we may have been better off where we were because Middle Tennessee had more ice than snow! Power was off in some areas and cable was out at our house. By the time we headed home on Friday the major highways were clear. I didn't hit any obstacles till I got to our subdivision. The road in was a little touchy; our street, on the other hand -- oh, my! At least 2 inches of ice with a light coating of snow greeted me. I knew I was going to have to park on the street, but getting down and up the little dip to our end of the street was challenging. Thankfully a pair of Stable-Icers awaited me in the mailbox and I was able to make it up the hill -- though my dirty laundry and all my projects are still in the van. My dear husband made two trips down to retrieve my two sewing machines. We do have our priorities! More on our projects and accomplishments in the next post. Friday my sister-in-law and I went to Kentucky Downs to watch -- and wager on -- her cousin's filly Carolina Jasmine who was racing at the Fair Grounds in New Orleans. 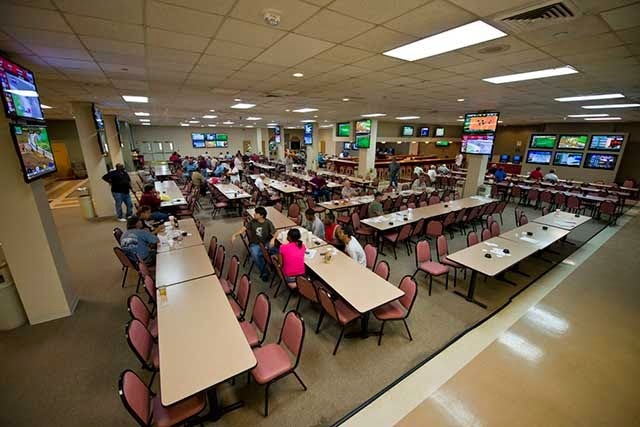 Kentucky Downs, though originally established as a turf race course, has morphed into a large gaming facility just across the KY state line off I-65. They have a room full of electronic machines and a bingo hall in addition to a room the size of a gymnasium devoted to pari-mutuel off-track betting. So we went early in the afternoon to get the lay of the land. In this huge room are six banks of six wall-mounted TVs showing races from six different locations around the country. Talk about sensory overload! Fortunately, the sound is off in all but one and even that is intermittent. So you have to keep an eye on the screen to see which race is coming up, the lineup of horses, the odds, the combination bets, the picks to win, the minutes to post time ..... It took a while for our novice eyes to understand what we were looking at and how to interpret it. And, man did our conversations show our ignorance! But since we arrived during Race 2 and Race 8 was our goal, we had plenty of time to get our sea legs. We took the opportunity to bet on a few of the intervening races. I bet on horse color; SIL bet on the name. Neither technique worked very well! I put $2 on a white horse to show in Race 4 and got a $2 return on my investment. It was downhill from there! Being a retired teacher, SIL couldn't pass on a horse named Wild Student. He lost. Finally, after some technical difficulties at the racetrack, Race 8 was underway. Carolina Jasmine was picked to come in second, but having been burned on a place bet in a previous race, I put $10 on her to show. The odds were terrible. She led most of the way but finished second as predicted. And I came home with another dollar in my pocket (having lost about $10 in the other races). Wow - A dollar profit! It was a lot of fun and we'll definitely do it again in the future. Remember that lonely little fish on my design wall Monday? He has been joined by nine other little fishies. The pattern is Something's Fishy by Four Corners. Boy, were they resistant to being caught! Who'd think that a little 24" x 26" wall hanging could take all week to whip up? First obstruction was putting stitch and flip (some call them snowball) corners on 1-1/2" strips (you can see they are not exactly perfect). Next was making sure my fish were swimming in the correct direction (they're not). Then needing to make more fish because my light plaids were not showing up on the ecru background. Not sure if it shows up in this photo, the background is a muted basket weave that reminded me of a fishing creel. Today's adventure is a trip to Kentucky Downs. My husband's cousin has invested in a few thoroughbred race horses recently. Last year he sold his two fillies and bought a new 3-yr-old named Carolina Jasmine. Today she will be racing on turf for the first time at The Fair Grounds in New Orleans. She's predicted to place 2nd. SIL and I are going up to KY to watch the simulcast races and do a little wagering. We are both novices. I usually choose a horse based on it's color -- I'm partial to grays .... I wonder why ... Hopefully the chicken quesadillas will compensate for any losses! Linking up with Sara at Confessions of a Fabric Addict for Whoop-whoop Friday. I managed to FOCUS last week and ticked a couple of items off my list. First, I finished the Quick Cozy Couch Quilt top (from the book of the same name). I also made more blocks for Athena's Puzzle. The low contrast of the picture is apparently what attracted me to the pattern in the first place, so I concentrated on making more muted blocks. I started cutting from selected fabrics, focusing on the blue, then realized there was not enough contrast to see the design. More cutting ensued, and now I have enough pieces and parts for a third quilt ... or at least to make headway on the orange version. My little ironing board faces stacks of totes, many containing Someday Projects (or as blog friend Ramona calls them, USOs -- Un-Started Projects). As I was pressing Athena's blocks my attention was drawn to a tote labeled "Something Fishy." I recalled purchasing that pattern in Wyoming on a vacation trip in 2001, just days before 9-11. The youth group at church needs auction items to raise funds for their summer mission trip, so I decided a little wall hanging like this might be attractive. What was I thinking? I jumped right in and began cutting my collection of plaids before I realized that those fish are only 2-1/2" high!! Doing sew-and-flip corners on a wobbly 1-1/2" strip is not easy -- at least for me with only partially functioning hands and eyesight (aging is no fun, but the alternative is worse!). I swear the sample I saw in the shop was larger than 24" x 26"! Or was it? After 13 years, who could remember? Only nine more little fishys to go! Also up this week -- assessment of Strips and Curves, the dinosaur project going to retreat with me next week. I see hours of sewing strata ahead of me -- more 1-1/2" strips! Keeping up with my commitment to sew at least 20 minutes a day has been fairly easy, so far. Finding an extra 20 minutes to keep projects moving along, sew-sew. First, I've kept plugging on the Quick Cozy Couch Quilt. BTW, I finally had the inspiration to Google the source for this quilt. It's from the book Quick Cozy Couch Quilts (duh on me) by Sandy Thompson for Cozy Quilt Design, available at cozyquilt.com. As planned, I have been addressing the extra, more muted blocks for Athena's Puzzle. There will probably be enough blocks for three quilts before I get done! I still don't know if these will go into a quilt or not. They may become border for something else or go on the back of something. I will finish the extra blocks this week and pack them up to take to retreat week after next. So stay tuned on the continuing puzzle of Athena. Yesterday I found time to analyze one of my Someday Projects: Something Fishy. I bought this wall hanging pattern on a vacation trip through Wyoming in 2001, just days before 9-11. The kids at church need auction items to raise money for their summer mission trip and I think something kitchy like this will be attractive to bidders. I'll include a picture in my weekly report on Monday. It's warming up here in Middle Tennessee. Hope y'all have a nice weekend. After posting my list of priorities last Monday, in my typical Quilter's ADD fashion I attacked No. 2 first. I'm not sure why it perked to the top, but I'm proud to report I stuck with it and finished! After struggling with how to finish it up, I'm quite pleased with the result. I don't have an appropriate fabric on hand for the back, but I have made the binding which will get filed with the top in the TBQ (to be quilted) stack. 4.0 yards out. I know we're going into the second month of 2015; however, I'm still formulating my resolutions. As stated before, my #1 resolution is to FINISH whatever I choose to work on. "Finished" is when a top is complete. Defining a time limit for this to happen is another matter; it's not always possible to work on a project from start to finish without interruptions. Maybe I'll just say "finish in 2015." I, Libby Smith, suffering from Quilter's ADD and buried under UFOs as well as Someday Projects, am joining Quilting Hottie Haven's third annual Drop and Give Me Twenty. I pledge to FIND at least 20 minutes every day in the month of February 2015 to move my projects along AND to FINISH whatever I choose to work on by the end of the month -- OK, that last part may be a stretch. In doing so I hope to finish at least 3 UFOs, one of which has been lanquishing in various stages for at least 12 years, and re-shelve all the fabrics that I pulled for Bonnie Hunter's mystery. I think Beth Helfter is brilliant for coming up with this concept and inspiring me to join. This challenge is right up my alley since I have been basically doing just that for the entire month of January 2015. In fact, a few days ago I blogged about using "found" time -- small increments here and there -- to tackle mindless processes like pinning and trimming. Last night I found time to get two rows assembled on my version of Quick Cozy Couch Quilt.